If you’re setting up a retail space with many different displays for merchandise, it’s important that when the customer interacts with that display everything is stable. If it’s leaning or rocking, one small bump from a customer could send your precious merchandise crashing to the floor! Wobble Wedges® offer a great solution for leveling and preventing sliding displays, plus they are a great looking solution (no more wads of paper or folded cardboard!). If you can afford custom-built displays for your small business, this might not be a problem for you. But for many small businesses you have to make cookie-cutter displays work with the space you have. So if your floor is warped and uneven, Wobble Wedges® can help you get your displays looking great! To level your display place a level on the top, check it both lengthwise and widthwise for level. If the flooring is hard (like wood, tile or laminate), use Wobble Wedge® soft/flexible shims to bring your display up to level. If your flooring is soft (carpet, padding, etc), use hard plastic Wobble Wedge® shims, they will give you stability on the soft flooring. 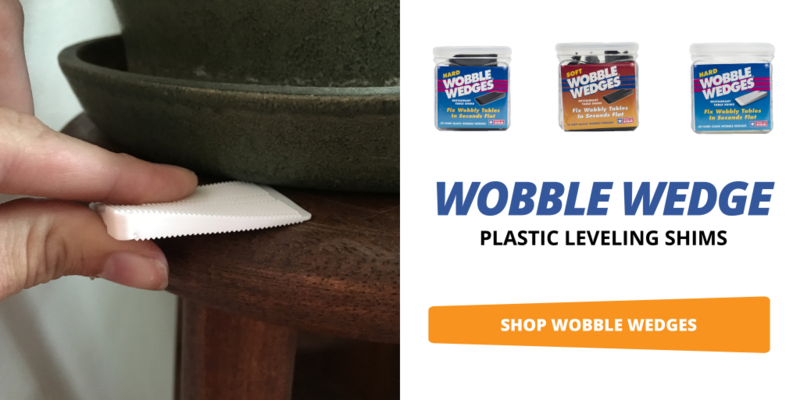 Wobble Wedges® come in three sizes, BigGap, Standard, and Minis, so you can get exactly the right size you need to keep your displays from leaning. Below is an image of a display on a very warped wood floor. Luckily a Wobble Wedge® soft/flexible shim in black blends in seamlessly with the display stopping it from rocking back and forth. Sometimes retail displays have to go on a surface that the display isn’t ideal for; so if it slips and slides around, our soft/flexible plastic Wobble Wedges® will help! The flexible plastic wedges can grip slippery surfaces, like glass or tile, allowing you to place your displays wherever you need them! Place them underneath an object or display and they will grip the surface, meaning customers are much less likely to move the display or merchandise by accident. 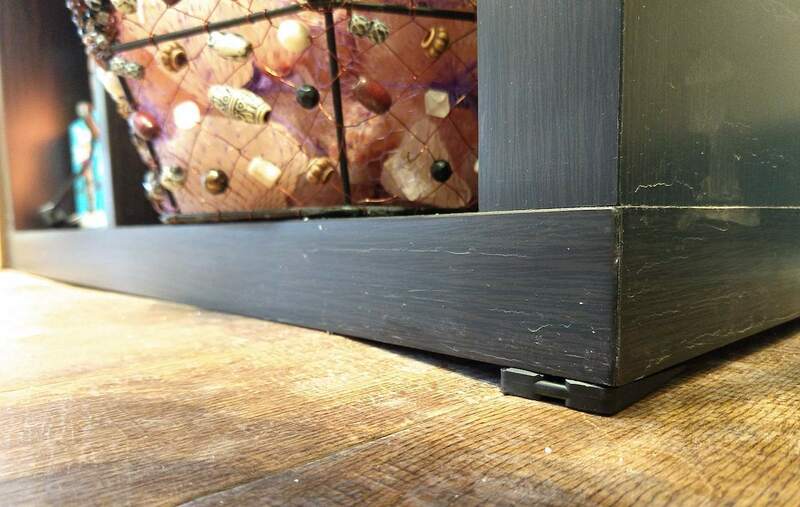 Below we’re using Mini Wobble Wedges® to secure a spinning earring display in place on a glass-top display case. The patented ridges on Wobble Wedges® not only allow our wedges to be safely stacked, they also help with keeping items in place by gripping the surface. The best part of all is that Wobble Wedges® will give you a professional look to your displays. Customers probably won’t even notice them, since they come in three colors, clear/translucent, white, and black. Wobble Wedges® will make any retail space look great, and will provide the stability you need to keep your business looking good.